Gold took wing Friday, energized by weakness in the dollar. The $23 upthrust stalled almost exactly at the 1302.90 Hidden Pivot midpoint resistance shown, validating both the bullish pattern and a 1330.40 target we’ve been using for the last week or so. (Note: These numbers differ slightly from the ones given here earlier because the pattern’s point ‘C’ low changed.) The 1330.40 ‘D’ pivot will become our minimum upside objective if the futures can close for two consecutive days above p or trade more than $3 above it intraday. Traders please note that a pullback to the green line at 1289.10 from around 1310.00 would trip a ‘mechanical’ buy signal, stop 1275.20. Stay tuned to that chat room for further guidance on this in real time.______ UPDATE (Jan 28, 4:17 p.m.): The futures look like they’ve consolidated sufficiently for a decisive push past the 1302.90 ‘midpoint resistance’ noted above. 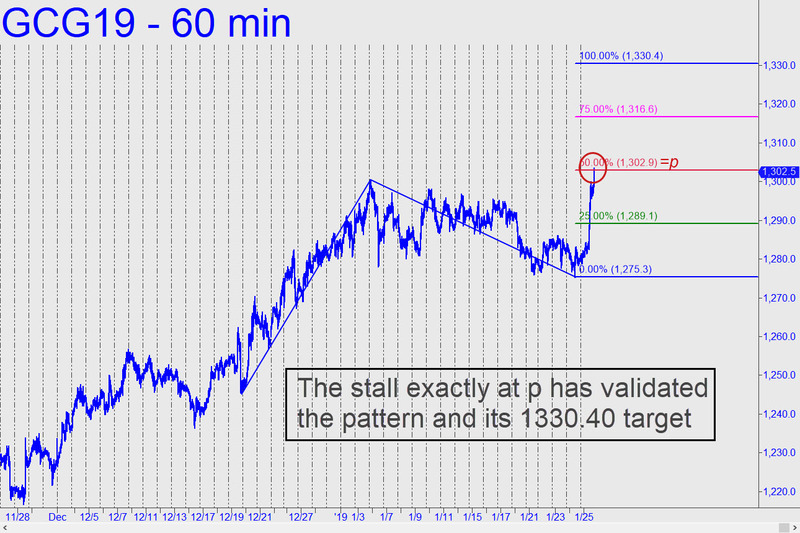 Once this occurs, the 1330.40 Hidden Pivot will be in play as our minimum upside objective for the near term. _______ UPDATE (January 29, 12:01 a.m.): Shifting to the April contract, here’s a chart that shows a 1336.40 target equivalent to the one given above for the February. One year ago (late January) I stated in the chat room that it would take a close above 1400 for me to me a buyer. 250 trading days later, my opinion has not changed. I could make a case for 1330 as you have and 1380, but, day trading aside, I will stick with 1400 for a swing trade.